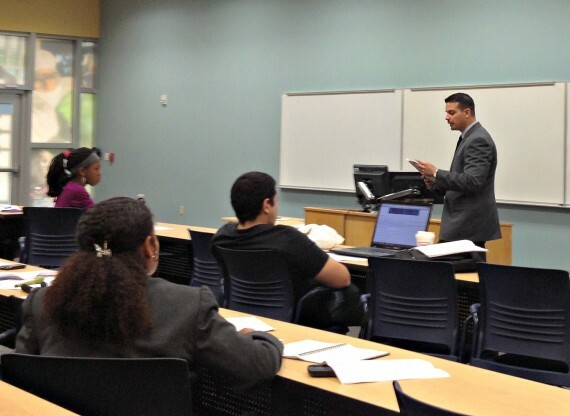 Jose Paonessa (right) talks to students about money management. Between dealing with student loans, purchasing supplies and textbooks, credit card debt and housing costs, among other expenses, it can be difficult to envision graduating with your financial health intact. That’s why Wells Fargo employees conducted a personal finance workshop at Modesto Maidique Campus for current FIU students and high school juniors and seniors preparing for college on July 19. Jose Paonessa, a Wells Fargo store manager in Miami, spoke to students about the importance of money management while Lupe Casanova, the senior relationship manager of the Wells Fargo At Work Program, delivered a seminar on credit. Many students wait until after graduation to get their financial situation in order, but by then it might be too late for many students. According to CNN Money, college students graduating in 2013 have an average of $35,200 in college-related debt that includes student loans, credit cards and money owed to family members. There are steps students can take right now, however, that can help them get their finances on track. And they don’t have to wait until they’re in a hole that seems impossible to climb out of. Finishing college debt free. Saving up for a new car or summer vacation. Building an emergency fund. Financial goals are the destinations you want to get to with your finances. According to Paonessa, having a vision for your finances helps students stay motivated in their journey to financial health. “It’s important to have a plan in place and start thinking now where you want to be a year, five years, ten years from now,” he said. Set up goals for your finances and set a timetable to reach them, and then put a plan in motion to attain those goals. If financial goals are destinations for your money, then budgets are the GPS. They let you know where you are in terms of finances, show you where you need help and keep you focused on your goals. “You need the directions to get to where you want to go and a spending plan is just that,” Paonessa said. A budget is a spending plan created by identifying your monthly income and categorizing expenses accordingly. Ultimately, having a budget allows students to take inventory of their financial standing, track and eliminate wasteful spending, and find ways to finish the month with a positive cash flow. Without one, you’re just guessing how much money, if any, you have left to spend. “The only way you can get better at spending and saving is knowing where your money is going,” Paonessa said. Peonessa also advised on sticking with a budget for two to three months while also adjusting it every month, since spending varies from month to month and to turn budgeting into a regular habit. Emergencies happen. And when they happen, they tend to be costly and throw budgets and financial plans into disarray. That’s why saving up to establish an emergency fund for life’s unexpected expenses is essential to financial health. Make it the first thing you do with your paycheck or scholarship money received. After your emergency fund is fully established, you can use those savings towards attaining the financial goals you have already established, including reducing your existing debts. “Before graduation, start assessing what you do have as debt and begin paying it off so that you can remove or reduce the burden,” Casanova said. Whether it’s a seldom-used cable service or highly priced textbooks, chances are there are some things you can cut from your budget that will help you save money. In his presentation, Paonessa identified eating out, using a credit card instead of a debit card, and impulse buying as just some of the leading causes of overspending. Eating leftovers and cutting the number of times you eat out during the week can help students save on food. Paonessa also recommended trying out a “Buy Nothing” week once every few months, which could save students up to hundreds of dollars worth of spending in a seven-day span.